I bought one of these because I was not too thrilled with my Arcam DVD/SACD player and most of the reviews said the Sony could walk on water. Yes ,it's built like a tank and it's heavy, so is a cinder block. Ok performance on Redbook CD's, not the life changing sound I was expecting based on all the positive reviews. Even running through my McCormack DAC the sound on normal CD's are warm but it has a narrow sound stage and not as much detail as I would have thought. My Arcam is miles ahead of it and I'm not a big fan of the Arcam. The Sony may or may not play Hybrid SACD's or even plain SACD's . It suffers from a finicky laser that won't hold alignment and is no longer serviced by Sony. If you search online you can find the "secret code" to do an in machine re-alignment via the remote but that doesn't always work. Newer models MIGHT play Hybrids. Older models (probably mine) came out before format was invented. Spend a little more money and buy a used Oppo or even an Arcam. The Sony makes for a great door stop or anchor for a small boat. The SonyDVP-S9000ES looks great and is built like a tank. I like using the remote from our old $80 Sony DVD player better though, it is not as wide and scans better and has some other features I can't find on the S9000ES remote. I would of gave this thing 5 stars all around but am bummed that it only plays factory discs, I have my old Sony on top of it and just use that for burned discs. The movies quality is fantastic and CD music is heavenly. I should of given it 5 stars for the fact that it only cost me $50 and I can't believe how good everything looks and sounds thru the Sony. I have it running thru a Yamaha receiver into ADS M-12 towers for the speaker mains, and Advent "the Heritage" towers for surround, plus an Infinity PS-12 sub. It is very much like going to a movie theater for our family now. A friend turned me on to this machine, he bought one without a remote for $200 and then found that the SACD didn't work, the CD player sure sounded good though, I waited until a one owner unit showed up locally for $175 with remote and all functions working, I went to the owners house, "Mike" and he auditioned the unit for me, a very gracious host, I was satisfied and took the player home, it was immaculate in appearence and function and the sound quality was just what I have heard and read, redbook is the best I've heard in a non-upsampling player and the SACD disc's I own but have never heard were just mind blowing, my twenty some year old Nakamichi OMS-7II just got put into the closet for good, I don't know how many hours are on my unit or if it's even broken in yet but I don't really care, build quality on the player is amazing for this day and age, take your time find a good one and then buy it, for audio use you can't go wrong, for $175 or so it's a no brainer, try track 6 from "On an Island" by David Gilmore for redbook magic and any 20 bit or MoFi cd for better sound, SACD is even better, enjoy. I bought this player off ebay on recommendation from a couple of friends who swear by them. I bought it 100% for 2 channel audio (I have a Marantz DVP8400 for the movies) and I must say I'm convinced. As soon as I plugged it in I noticed a brilliance and clarity in my CD's I've never heard before. I admit though, my previous cd player was a cheapo panasonic, hardly even a comparison. It sounds better for audio than the Marantz I have upstairs and that's not a cheap player. Considering I bought this for $150+$20 shipping off Ebay it's an outright steal. I only have a couple SACD's and it plays them fine so I haven't experienced and "weirdness" or glitching. It does have an issue with recorded CDs, the best way around that is to copy them at the slowest speed possible....then it seems to work ok. I don't play many recorded CDs though so this isn't usually a problem either. I imagine if I wanted to spend $2000+ for a new model I could forgo the recordable CD issues but it's truly not worth it, nor do I have that kind of cash to throw around. Great picture and love the Cd sound. Haven't tried the sacd part. The loading mechanism is fragile (don't push on the tray...use the magic button) and has broken at least 2 times in the past 5 years or so. I love this machine, but much Sony gear sounds bright to me and this is no exception for CD, whether I use the preamp's d/a or the player's d/a. But 5.1 sound completely rocks in soundstage, impact, positional cues, etc. The picture is wonderful. Sharp, bright, detailed, not harsh (tho' video harshness has much to do with the cabling (use the component outs!)). Oh, no digital video out in this unit. In any case, it is a great all around unit and was a great value (deal). While I want to get a newer CD player for MP3 support, etc. This unit is great for DVDs and Cds. I never imagine parting with it (well...as long as the loading mechanism works anyway). Unparalleled audio fidelity from a dvd player. Soundstage depth, life-like imaging, control, emotion and fluidity. Build quality. Video performance has an edge over everything i've seen in terms of motion control, image focus, detail retreival, lack of noise. Looks fabulous. At $450 against today's tech, 5 stars for value, 5 stars outright for reference performances on sacd and dvd. No multichannel, but this is 4 year old technology. Hard to fault for me. A long and storied path has finally brought me to the 9000, where this journey ends until HD-DVD is a reality. I no longer search for the next box. This modern classic has eclipsed in both video and audio performance any dvd player i've owned in the past four years. The contenders that have fallen: Denon dvd-2800II- equivalent audio fidelity, no sacd, picture is softer. A nice player Panasonic RP-91k: good sound, after endless fiddling, couldnt find the middle ground between too sharp and too soft. nice player Pioneer DV-47a- Excellent picture, totally unremarkable sound in any format. Sounds like a middling cd player. Sony DVP NC-555es: Great looks, good sound, picture is vibrant but has a lot of trouble with moire patterning and combing. Bad flag reading. Drops to video and stays there. dv-47a, rp-91k, dvp-nc555es, dvd-2800ii. other sony, toshiba econoboxes. Class Leading Video Performance. Exceptionally good two-channel SACD performance. Good performance for redbook CD (exceptional considering its price and the fact that its a multi-purpose player) Build quality is exemplary. Its also beautiful to look at. This is an excellent player. I own 5 different multiformat players. For video, this player is about the best you can do, other than a high-end Arcam or the TagMcLaren DVD player. I have the 40" Loewe Aconda Direct view Tube set, which is probably the best HDTV picture money can buy IMHO. This set will deliver the best performance in reproducing colour, and will only be equaled, perhaps, by the vey best Plama displays. The DVP-NS9000ES is exemplary in reproducing colour, evidenced by the richness of the picture on my Loewe Aconda. It also will produce images of exceptional clarity, although without excessive sharpness, which can tend to make a picture look slightly artificial. On movies like The Matrix series, the blacks are very rich and true. There is no chroma bug with this player. Sound: For two-channel SADC, this player is exemplary. It never sounds harsh, so often a problem with SACD playback on other players. It reproduces lots of inner detail lesser players will be incapable of. I have the Sony SCD-777es, and to my ears the 9000es is its equal for two-channel SACD playback. As a 'redbook' CD player, it is very decent, but certainly not the last word, but that is to be expected in this price range, and considering it is a multi-purpose system. It will still be significantly better than most average CD players out there. A word on build quality. This player is built with great quality. Sony actually overbuilt it, and the all copper chassis alone is worth the price of entry. At used prices this unit is a steal. Be confident about spending your money. This player will not disappoint. I've gotta admit, I'm a little disappointed in this player. After reading the rave reviews the Sony has received in the audio press (especially in The Absolute Sound and The Absolute Vision), I guess my expectations were a bit inflated. First off, there's the video. This is quite good, but no where near as stunning as the critics made it out to be. The Sony's video is a little too soft for my taste and colors are a tad muted (I expected the former but not the latter!) I think the Pioneer 47Ai (for example) easily beats the Sony in this regard, having a sharper picture with more vibrant colors and greater detail. Next there's the audio. As promised, the Sony performs admirably with SACD (two channel only!) but with cd it's nothing special. I also own (in addition to the Pioneer above) a Philips DVD-962SA player whose sound quality with cd's is easily on par with the Sony, and whose SACD playback is very nearly as good- and it does multichannel! I guess the long and short of it is that the Sony is a very good player with excellent build quality... but performance-wise is a bit overrated. Something else I neglected to mention was the player's peculiarity of occasionally refusing to play some SACD discs. This usually occurs with hybrid discs which play normally on my Philips player- the Sony can only be coaxed into playing the non high-res cd layer. Strange. This is my second review on this website so bear with me ,Heck I'll just cut to the chase I believe honestly the only way you can improve on a machine like this is with a high definition dvd player .I say that because I thought it was getting a little long in the tooth so the upgrade bug hit me ,I tried to replace it with many dvd players nothing could top it . At first you know I would look at the picture with various dvds and compare it with various other players and the picture looked soft I did this for about a month. The entire time my wife said this player looks better thant the others it doesn't look hard and the colors are better I was thinking shes crazy so the more I looked at it the more I noticed what she meant every other player I compared it to looked like the luminance had been goosed like someone had just turned the sharness up and then you look in the background of the different dvds theirs no picture noise I'm not one of those guys that says this things better than that and vise versa but I see whats happened manufacturers have been 4 at least 2 years goosing dvd players to make them look sharper but it's not real detail and my wife noticed it before I did. The only thing I can say for sure is that if you have one hold on to it or sell it to me. believe it or not the picture is better interlaced and I promise you guys ,girls this is something tangible it's not subjective or at least to me,just because somethings newer it doesn't make it better.I know I haven't seen anything as noise free or as sharp with true detail in another dvd player ALSO CAN INITIALLY LOOK SOFTER IN INTERLACED MODE UNTIL YOU LOOK AROUND OBJECTS WITH ACUTE DETAILS AND SWITCH BACK AND FORTH BETWEEN PROGRESSIVE AND INTERLACED MODE, PROGRESSIVE HAS MORE SNAP BUT SHARPER NOT TO ME .THINGS AWSOME! great picture quality,vivid inpactive sound in dvds ind cds. 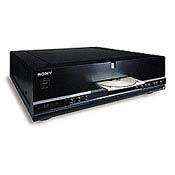 The DVP-S9ooes DVD player that I purchased in 2001 has proved reliable since I purchased it. It has wonderful sound and picture quality. The C.D. section is comparable in my judgement with my Parasound Ultra 2ooo cd player. I noticed in using various brands of cd-rs that it plays some but not others-I find that maxell cd recording disks do play on my unit. To summarize I find this unit to be excellent in every way.